Gwynllyw the Bearded (or possibly the Warrior) lived in the late 5th and early 6th centuries. He was King Glywys Cernyw's eldest son and he inherited the main eastern portion of the Kingdom, bordering Gwent. It became known as Gwynllwg after him and his capital was eventually established at Allt Wynllyw on Stow Hill in Casnewydd (Newport). 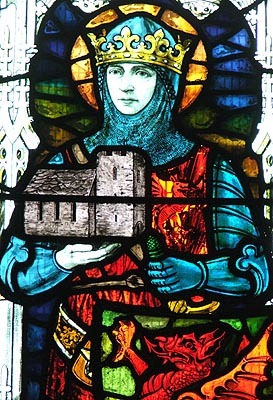 Gwynllyw fell in love with Princess Gwladys, the eldest daughter of his neighbour, King Brychan Brycheiniog. He sent envoys requesting her hand in marriage, but Brychan sent them away. So Gwynllyw decided he would take Gwladys by force. With three hundred men to help him, he made a daring raid on Brycheiniog and made off with his love. Brychan pursued him as far as Fochriw where the two were accosted by their High-King, Arthur. Struck by Gwladys' beauty, Arthur was at first tempted to take her for himself; but his fellows persuaded him to support Gwynllyw's cause and thus Brychan was soon placated. Gwynllyw was a warrior king well known for being a law unto himself like this. After the birth of his eldest son, he went on a wild celebratory raid on Gwent with his fearless Warband. Among other livestock, he stole the cow of St. Tathyw of Caerwent, who promptly arrived at the Royal Court of Gwynllwg and demanded it back. The King would not let the two go however, until Tathyw had baptised his new-born son into the Christian faith - almost certainly an action suggested by the Queen. In later life, Gwynllyw had a dream in which the God appeared and told him he would find a valuable white oxen on Stow Hill. Having found the beast the next day, the King was so impressed that he allowed his son, St. Cadog, to convert him to Christianity. He then founded the Church of St. Mary (St. Woolos' Cathedral, Newport) where the ox was found. Gwynllyw later married Gwladys' sister, Ceingar, and became father of St. Cynidr of Glasbury. The King died on 29th March AD 523 and was buried in his church. He was thenceforth revered as a saint.